It started ten years ago in 2008. Call it the "Liam Neeson Action Hero First Quarter Movie." With Taken, Pierre Morel and Luc Besson tried an experiment: put a suave, respected actor in a B-grade action movie and see how audiences reacted. The film proved to be a worldwide success and, when tossed into the bleak cinematic landscape of January 2009, it heated up the U.S. box office to the tune of $145 million. In subsequent years, the first quarter has become a home to this less-artistic side of Neeson: Unknown in 2011, The Grey in 2012, Non-Stop in 2014, Taken 3 and Run All Night in 2015, and now The Commuter in 2018. Three of those earlier productions - Unknown, Non-Stop, and Run All Night - were helmed by The Commuter's director, Jaume Collet-Serra, so he obviously understands the template and has developed a working relationship with the star. The Commuter falls into line with Neeson's other high-octane, low-intelligence efforts and part of the reason it works (to the degree that it works) is because of the sincerity with which the actor attacks the part. There's none of the wink-wink-nod-nod tongue-in-cheek cynicism that another performer (like Bruce Willis in his prime) might bring to the part. Neeson dares us to take things less seriously than he does and, if the story wasn't so preposterous, we might accept the offer. Unfortunately, the plot for The Commuter sets the suspension-of-disbelief bar too high for us to do more than chortle at the movie's awkward and artificial attempts to set up its action set pieces through a series of implausible contrivances. Collet-Serra is attempting to create a Hitchcock-like "refrigerator movie" while forgetting that the first rule of such films is that the audience has to buy the story "in the moment" even if they might question it later. To be sure, there are some effectively taut moments that work on their own, divorced from the mess of the storyline in which they are marooned. They're like better pieces of a larger whole that have somehow found themselves here. I'm thinking of a scene in which Neeson's Michael MacCauley is trapped in an unenviable horizontal position or another in which the majority of the movie's special effects budget was used. The film's whodunnit? aspect is feeble; if you're looking for a mystery on a train, a better option would probably be Kenneth Branagh's recent remake of Murder on the Orient Express. Poirot may not have the physicality of MacCauley but he has a more impressive mustache. The movie opens with an effective montage designed to provide a sense of the monotony that defines the weekday life of the daily commuter. Every day, MacCauley gets up early, boards the train into Manhattan, does his job (as an insurance salesman) with conviction, and comes home to his wife, Karen (Elizabeth McGovern), and his college-bound son. Money is an issue for the MacCauleys: they're living paycheck-to-paycheck while trying to squirrel away enough for their son's tuition. The situation becomes dire when Michael is victimized by corporate downsizing and, despite having only five years left until retirement, he is shown the door. The route home becomes the longest trek in his commuting life. Along the way, for no apparent reason, he stops at a bar and encounters a couple of relics from his past on the police force: his old partner, Alex Murphy (Patrick Wilson), and a former commanding officer, Captain Hawthorne (Sam Neill). Since these roles are played by "name" actors, we correctly assume they will play a more significant part at some later point in the film. Once on the train, MacCauley is approached by a well-dressed woman, Joanna (Vera Farmiga), who offers him a proposal: if he will locate a particular individual on the train that her "associates" are looking for, he will be paid $100,000 - no questions asked. It's a carrot-and-stick offer but MacCauley doesn't realize this until he balks at taking the cash. He's then told that if he doesn't comply, his family will be killed. He soon realizes that he's being set up and the person he's looking for was a witness to a conspiracy involving powerful people. 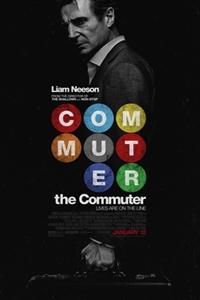 In all fairness, The Commuter delivers exactly what's advertised - a turn-off-the-brain action film starring Liam Neeson. It doesn't moralize or overplay its hand. The plot is dumb but that's often the case with movies like this. One of the screenwriters has apparently seen Spartacus but the scene he cribs from the Kubrick classic doesn't have quite the same impact in this context. I suppose it's fair to say that if you enjoyed the other Liam Neeson Action Hero First Quarter Movies, this one will pass muster. For me, it's too idiotic to be easily digested but I didn't hate it the way I often do January movies. And that's the nicest thing I can say about it.